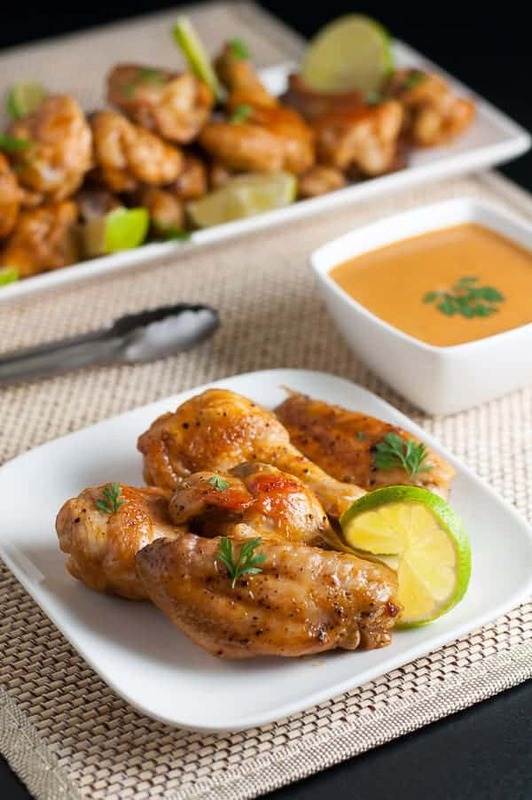 Enjoy all the complex flavours of Thai food and learn how to make spicy Thai wings. 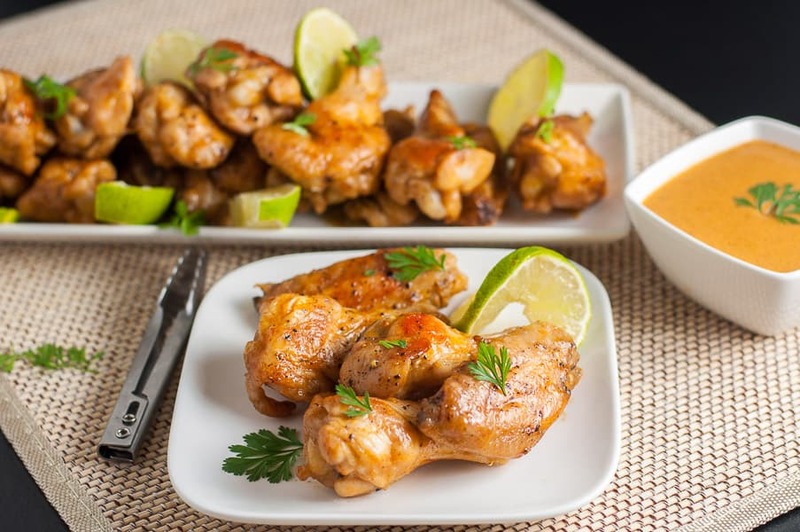 Sriracha hot sauce, garlic and ginger, coconut milk and lime on crispy chicken wings make this a popular appetizer or snack. You may have noticed a distinct lack of recipes using Sriracha sauce on this blog. While all you Sriracha lovers out there may find this hard to imagine, I have not been much of a Sriracha fan. These crispy, hot and Spicy Thai Wings have made me a convert. A fan. I’m not yet at the fanatic stage, or even a devotee, but these wings were fabulous. I liked them so much I’m dying to share this simple method for how to make the best hot and spicy Thai-flavoured chicken wings. Fresh and light Thai flavours of ginger and garlic, coconut and lime, all on a chicken wing make this recipe a keeper. 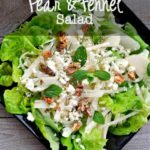 I love having a collection of easy recipes at my finger tips for last-minute snacks or appetizers. This is one I’ll make again and again. It has just the right amount of heat to make you reach for just one more. When I first tossed the chicken wings in the sauce, I found them too hot for my liking, but when I removed them from the bowl and transferred them to a serving plate, much of the sauce stayed behind and they were PERFECT. You can serve the extra sauce in a bowl for dipping for those who like the extra hot pepper heat. Toss with oil, salt and pepper, bake until crispy, then toss again with this spicy Thai sauce and serve. 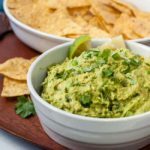 Don’t forget to offer a squeeze of extra lime, too! And tell me some of the ways you use Sriracha sauce in your home. 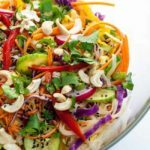 I need YOUR Sriracha recipe ideas! A crowd-pleasing appetizer with the complex flavours of Thai food. 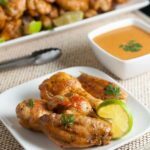 Ginger and garlic, coconut milk and lime with heat from Sriracha hot sauce makes these chicken wings irresistible. Heat oven to 375°F. Line a large baking sheet with parchment paper. Rinse wings and pat dry. In a large bowl, toss wings with 1 tbsp olive oil and sea salt and pepper. Spread wings on the baking sheet and roast for 30 -35 minutes or until crispy and lightly browned, turning with tongs after 15 minutes. Meanwhile, heat sesame oil in a medium pot. Add garlic and ginger and cook for 2 - 3 minutes. Add coconut milk, Sriracha hot sauce, honey, coconut aminos (or tamari or soy sauce) cinnamon and zest and juice of one lime to the pot. Stir and cook over medium heat for 20 minutes until well blended. Combine starch and warm water and stir into coconut milk sauce. Continue heating and stirring until slightly thickened. Remove wings from oven and transfer to a large bowl. 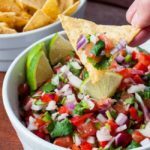 Toss with the warm sauce, arrange on a serving platter, garnish with cilantro or parsley and fresh lime slices and serve with extra sauce for dipping. 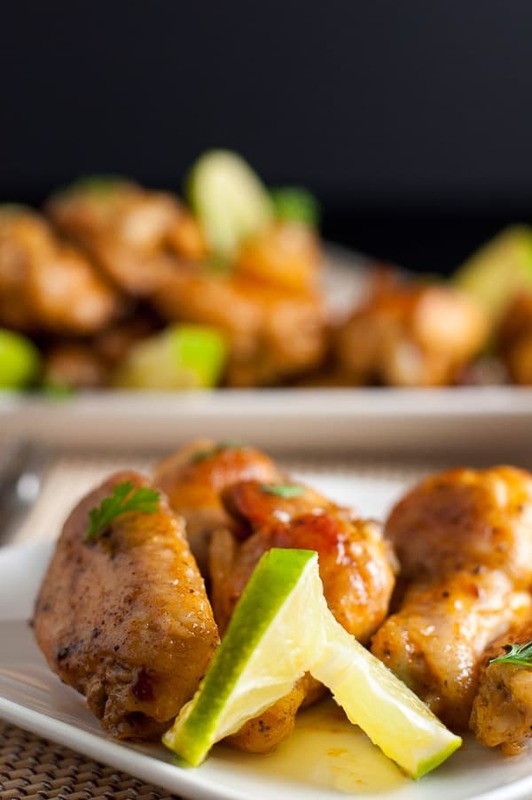 I adapted this recipe slightly (to give paleo options) from this Lime, Coconut and Chili Chicken Wings that I found on the Food Network site. This sounds very good. I will try it, except all the Sriracha Sauce that I’ve seen contains sugar. Thanks for commenting, Lauda. Yes, the Sririacha Sauce that I have does contain organic cane sugar. You might wish to try adding a little cayenne pepper instead.